Haile Plantation homes – How is the Haile Plantation real estate market? The Haile Plantation real estate market continues to strengthen. An analysis of Haile Plantation single family homes sold during the first half of 2014 shows that Haile Plantation single family home prices are up 7.3%, from $236,500 during the first half of 2013 to $253,750 during the first half of 2014. The average time to sell a Haile Plantation home was 106 days, down 37% from the 1st half of 2014, when it took an average of 168 days to sell a Haile Plantation home. Fifty six homes sold in Haile Plantation during the 1st half of 2014, down 37% from the 1st half of 2013 when 77 Haile Plantation homes sold. This is most likely due to the lack of inventory in the Haile Plantation real estate market. There are only 46 homes available for sale in Haile Plantation (as of July 12, 2014), indicating a shortage of inventory. Distressed sales (short sales and foreclosures) represented 5.4% of all Haile Plantation single family homes sold during the 1st half of 2014, down from 10.4% during the 1st half of 2013, hopefully indicating that distressed sales will continue to play less of a role in Haile Plantation home sales but only time will tell. The Haile Plantation condo market is also improving. Median sales prices for Haile Plantation condos was up 8.5%, from $103,500 in the first half of 2013 to $112,250 in the first half of 2014. 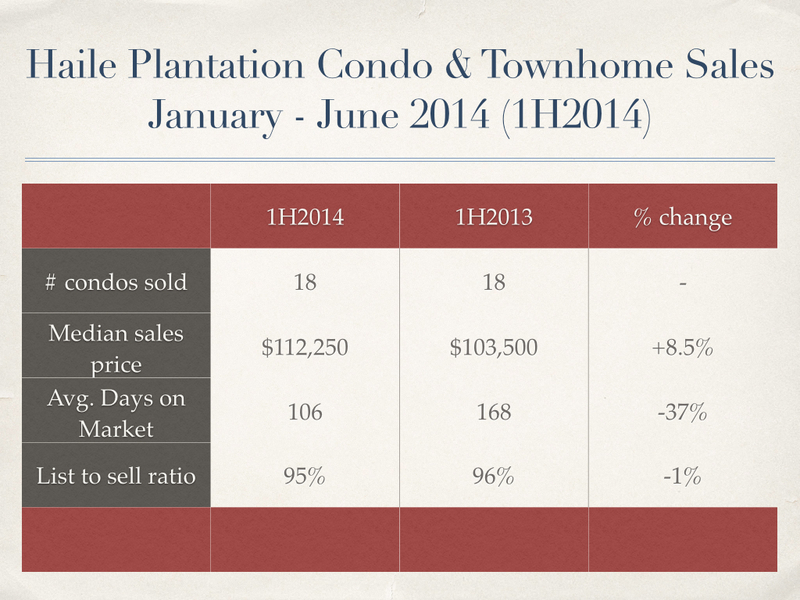 Average amount of time to sell a Haile Plantation condo during the 1st half or 2014 was 106 days, down 37% from the first half of 2013, when it took an average of 168 days to sell a Haile Plantation condo. 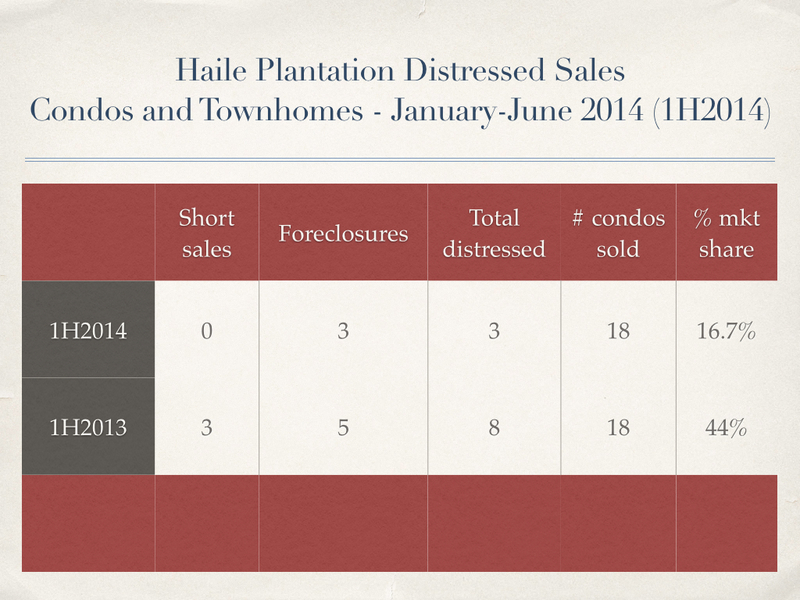 Distressed sales made up 16.7% of all Haile Plantation condos sold during the first half of 2014, a huge improvement over the first half of 2013 when distressed sales made up 44% of all Haile Plantation condos sold. Buying a Haile Plantation home? The Haile Plantation home market is much stronger than last year. 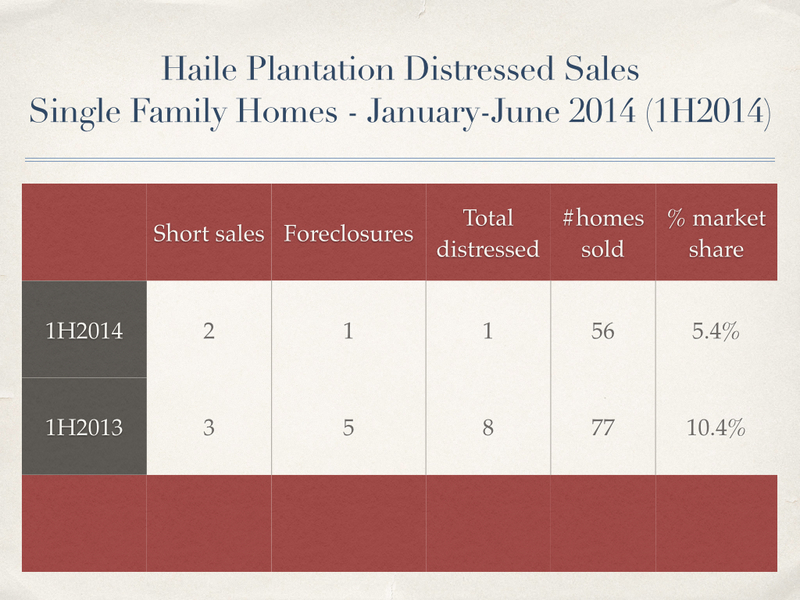 There are less Haile Plantation homes available for sale, meaning more competition for the homes available. If you are planning on buying a Haile Plantation home, submitting a lowball offer is a very bad idea. Selling a Haile Plantation home? If you are considering selling your Haile Plantation home, now is a very good time to do so. Buyer demand is up, there is a lack of Haile Plantation homes for sale, and interest rates are still low. Haile Plantation homes that are clean, priced right, and move in ready don’t last long in this market.